Leaving the modern visitor attractions behind me, I ventured on into the Superstition mountains. I was confident that I would not find a gold mine as my intention was to travel along the Apache Trail. 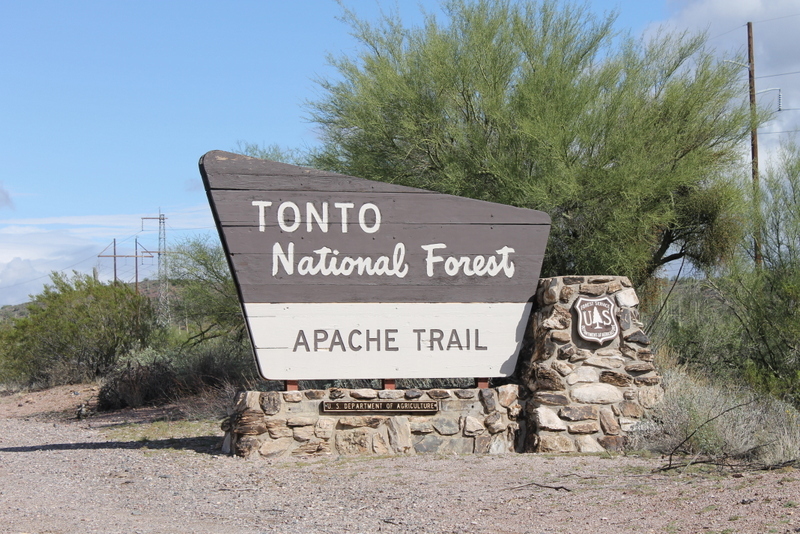 It is named after the Apache tribe who used this route to cross the mountains when making trading visits to other tribes. As a well-worn route it became the stage-coach trail and is now considered Arizona’s oldest highway. The route has been adopted into the State Highway system and is SR88 from Phoenix to Payson. Once past the official start of the route, the road looks good an easy to drive with the usual Arizona views either side. Once you pass Tortilla Flats, the road requires you to drive a little slower. Early on, a lowered BMW 3-series was behind me. When I looked in my rear view mirror a few minutes later it was no longer there, and turning to see the road snake back I saw that the driver had decided to give up. Driving north, I first passed Canyon Lake. after which I got to see some great mountain formations. I kept being reminded of my geologist friend who no doubt could not only identify the different rocks from their colour, but probably also explain how the formations got their angle and shape. Lake Apache was next along the route. The slide of the earth is really apparent all along the lake. At the northern end of the Apache trail is the Roosevelt dam, fortunately also a return of hard top on the road!